How about the marking of public space by a group or company that mars that public space for a profit? That marking and marring of public space can be done by a commercial sign or billboard. We think this huge billboard out in East County – nearly at eye-level with the 125 freeway in Lemon Grove – on a huge structure, is graffiti. It mars public space for private profit. Form of visual communication, usually illegal, involving the unauthorized marking of public space by an individual or group. Technically the term applies to designs scratched through a layer of paint or plaster, but its meaning has been extended to other markings. Graffiti is widely considered a form of antisocial behaviour performed in order to gain attention or simply for thrills. But it also can be understood as an expressive art form. Derived from the Italian word graffio (“scratch”), graffiti (“incised inscriptions,” plural but often used as singular) has a long history. It has been found in ancient Roman ruins, in the remains of the Mayan city of Tikal in Central America, on rocks in Spain dating to the 16th century, and in medieval English churches. During the 20th century, graffiti in the U.S. and Europe was closely associated with gangs. 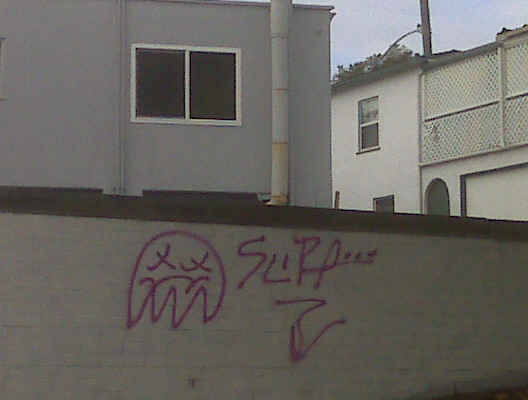 Graffiti was particularly prominent in major urban centres throughout the world; common targets were subways, billboards, and walls. In the 1990s there emerged a new form of graffiti, known as “tagging,” which entailed the repeated use of a single symbol or series of symbols to mark territory. The “urban dictionary” has wider definitions. Okay, so what exactly is the connection with the billboard and Ocean Beach? The billboard in question is an advertisement for the law firm of RJS – which stands for Ronnie J Shamoun, a wealthy lawyer who used to sit on the OB Planning Board and who has had a relative also sit on the Board. 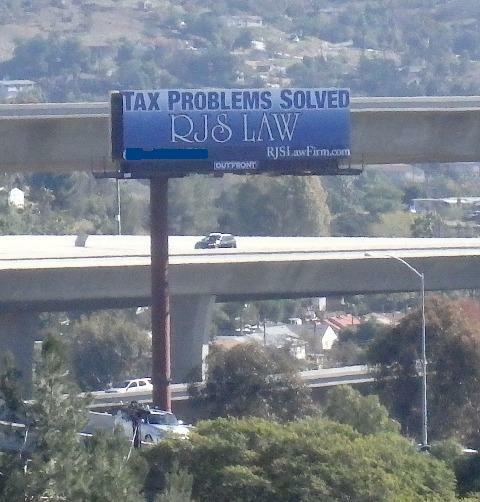 The RJS law firm, a tax firm, has large billboards all over the City and County of San Diego. We have to ask, how can someone who hails from OB and who says they have a commitment to the environment and keeping OB the way it is, be responsible for so much graffiti around our city and around our county? 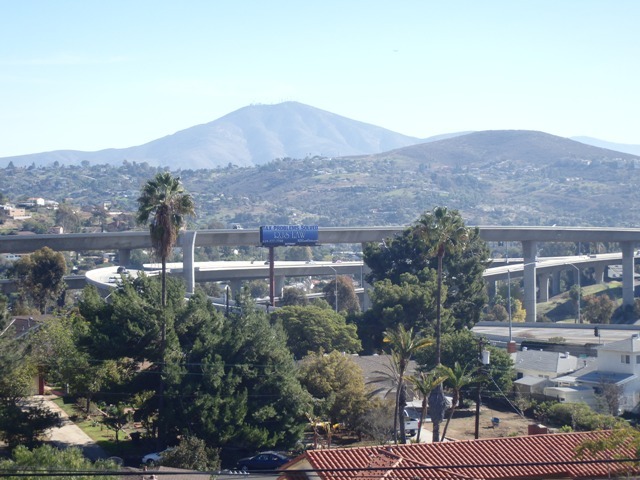 It is true that the “view” is already marred by the presence of the huge, monstrous freeway system. But at least the freeway is a public object that is marring the scenery, and not a giant for profit billboard. Indeed, unless the billboards fall/I’ll never see a tree at all. Mr. Gormlie, why are you excoriating the advertiser rather than the company that maintains the damn billboard? Could it be you have a personal beef with this lawyer? Great Ogden Nash quote ! Sure it’s graffiti. Just as surely as the words of Sarah Palin and Ted Cruz are. The diff between graffiti and free expression is, money.